Download Florence Foster Jenkins in Digital HD from the iTunes store. Florence Foster Jenkins images are © Paramount Pictures. All Rights Reserved. Have you ever had a dream you wish you could accomplish? Ever think you are better at something than you actually are? Florence Foster Jenkins is someone who could answer yes to both these questions and her story is dramatized on the new film of the same name. Coming to theaters on August 12, 2016, Florence Foster Jenkins soars to great heights and lifts one's spirits. Florence (Meryl Streep; The Devil Wears Prada) was a socialite in 1940's New York City who always wanted to be a singer. Sadly, she wasn't very good. Interestingly, she didn't know she wasn't very good. Florence would perform mini concerts for her friends and raise money for the arts, which was fine, as her "talent" was only exposed to a small group of people. Her husband, St. Clair Bayfield (Hugh Grant; Music and Lyrics) is her biggest fan and cheerleader. He loves her unconditionally, while he lives with another woman in a home Florence pays for. He also makes sure nobody criticizes Florence for her lack of natural ability. Cosme McMoon (Simon Helberg; The Big Bang Theory) is a pianist with dreams of accompanying the most celebrated of singers. However, he takes a job to pay the bills as Florence's practice pianist, but finds himself in disbelief as her first notes exit her mouth. Afraid to be embarrassed, but eager to remain employed, he eventually agrees to play Carnegie Hall with Florence while secretly praying either he or Florence become ill. I can't imagine anyone other than Meryl Streep portraying this delusional, optimistic singer. Streep simply didn't sing badly for this role, she learned how to specifically sing badly as Jenkins had and it makes her performance all the more captivating. She finds Florence's phrasing and breathe patterns to honestly portray the socialite and also captures her emotional highs and lows. Grant was born to play Bayfield as a somewhat roguish statesman with a flair for the dramatic as his forming profession as an actor enables him to emote lavishly. However, his fondness and protective nature for Florence is part of the essence of the film and Grant does a beautiful job at conveying that on screen. Helberg is masterful at displaying emotion without saying a word and stands toe to toe with these screen giants in every scene. His facial expressions are so incredibly acted that he manages to speak volumes without actually saying a work. He masterfully expresses what the audience is thinking which makes him an asset to this film and when he does actually speak, he delves into McMoon's mind as the somewhat naïve yet adult pianist. The script is well written and the sets and costume design take the audience back to 1940's New York in grand splendor. The film moves at a perfect pace, which combats the possibility of boredom. 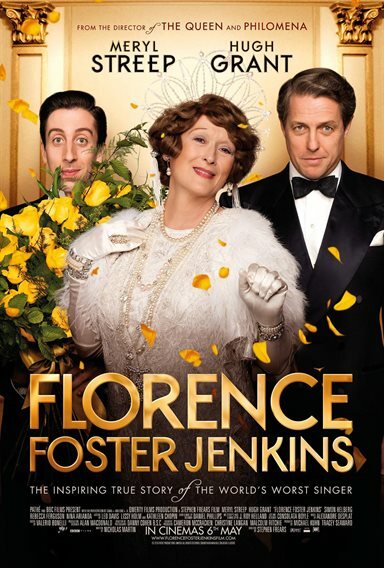 Director Stephen Frears (High Fidelity) is known for his eclectic resume and Florence Foster Jenkins is no exception. It has the Frears stamp while not mimicking any of he previous works. The movie is about so much more than just the triumphs of the human spirit. It is warm and touching and heartbreaking all at the same time. It reminds us to dream big, no matter what people say, and surround oneself with people who truly care. At its core, it reminds us to champion those we love, and ourselves, and to dream the impossible. 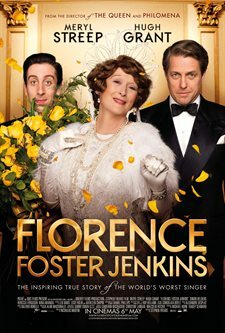 With all the right elements in place, Florence Foster Jenkins simply makes audiences happy and exit the theater with a big smile on their faces.